What an enjoyable night in the theatre: a real company achievement. Colourful designs, well-thought-out dramatic progression, and sharp Personenregie combine to award Andreas Homoki’s Love for Three Oranges the status of a classic. It makes sense insofar as commedia dell’arte makes sense, and makes nonsense in a similar fashion. From the Prologue, the stage is set for a framing battle between comedy and tragedy, but what does it mean? Answers are less of the essence here than exploration, still more so a setting for Prokofiev’s score to perform its magic. Richard Taruskin, in his New Grove article on the opera, writes: ‘This was one of the very earliest applications of illusion-destroying “art as art” gimmickry, soon to become such a modernist cliché.’ It is perhaps not surprising that a writer so hostile to modernism should prove unable to resist such a barb; the important thing here, however, is that modernism is shown to be anything but killjoy. This joyfully bizarre production, full of wonders that cannot and need not be explained, ensures that outcome. 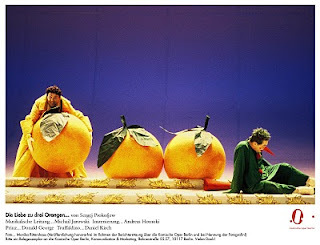 Indeed, one should remember – and Homoki’s production relishes the fact – that the opera transmutes a host of operatic clichés into gold, all the time quite without false pretension. One can consider, to be sure, but most of all, one can enjoy – and through that one enjoyment, one is brought to consideration. 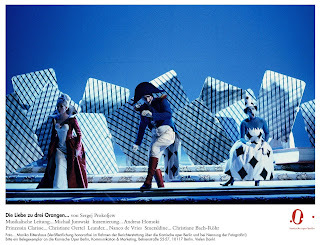 The direct communicative gifts of the Komische Oper’s cast played a considerable role here. These were not all great vocal performances; indeed, some, such as Aurelia Hajek’s Fata Morgana, left a considerable amount to be desired in purely vocal terms. Nevertheless, dramatic commitment tended to trump any such shortcomings. Christoph Späth’s Prince impressed somewhere on the border, as he should be, between ingénue and madman: Tamino taking a walk on the (slightly) wild side. Carsten Sabrowski’s King exhibited story-book authority in an appropriately kindly fashion. Meanwhile, the plotters, Leander and Princess Clarice, Horst Lamnek and Christiane Oertel, were nasty and a little grotesque – but never too much. Nina von Möllendorff was a lovely Ninetta and Karolina Gumos a wonderfully bizarre – here blue, not black – slave-girl Smereldina. 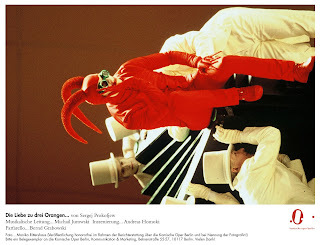 Meanwhile, Hans-Peter Scheidegger’s Cook was a surrealist joy in drag for, as the cliché has it, children of all ages. Perhaps the truest heroes were the orchestra and chorus. The chorus proved expressively adept, with words, notes, and gesture in happy combination. Ably directed by Stefan Blunier, the orchestra contributed essential bite and direction to the proceedings. Though not quite so declamatory a score as The Gambler, melodic development – and, equally important, discontinuity – is more often than not to be found here in what one might consider the composer’s Greek chorus. The hit-tunes still register, of course, and Prokofiev was so fine a melodist that he could never quite deny himself, but this performance reminded one that there is a great deal more to his gifts than that.